This past weekend JConcepts Team Driver JP Richards attended the Halloween Race held at CRCRC. 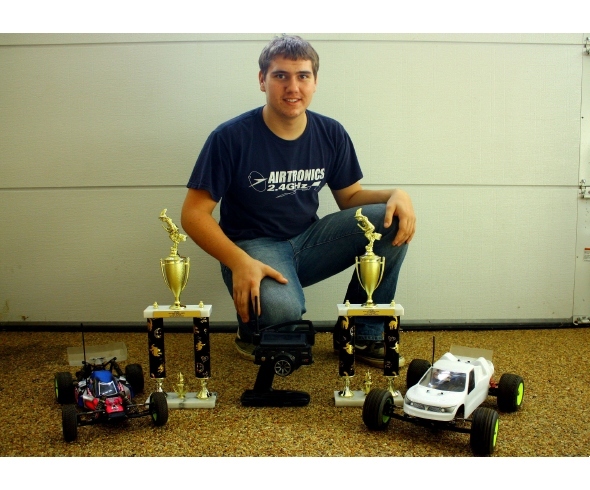 JP competed in the modified 2wd buggy and truck classes. The race was pretty well attended for a one day event with over 100 entries. Five hours of practice on Friday night gave JP the confidence going into qualifying on Saturday and he was very comfortable with his cars, starting out on JConcepts Blue Bar Codes. In the first round of qualifying in 2wd Truck, JP TQ’d by 10 seconds. In round two JP had technical difficulties and was not able to run and he lost the TQ. In the final round of qualifying JP knew that he had to put a solid run in to get TQ, sadly this did not happen. Going into the main event JP knew that he had a good car to win. JP started in the 2nd position right behind TQ of Paul Sinclair for XFactory. At the start of the race Paul and JP had a good race going but an early wreck by Paul let JP by to take the lead and go on to win the race. JP ran JConcepts Blue Bar Codes in the rear and JConcepts Blue Carvers in the front. 2wd Buggy qualifying was about the same as truck. JP TQ’d round one by four seconds, he felt like he had a pretty solid run. In round two JP was on a run to better his TQ but was not able to do so due to a wreck. This gave Dan Griffin from AE the chance to take TQ away from JP by a little over a second. Going into the final round JP was hoping to take TQ but was unable to do so. Going into the main event JP knew his car was prepped and ready to go. JP qualified in the 2nd position only one second behind TQ of Dan Griffin. The 2wd main was a very close battle for the seven minute race between Dan and JP. JP made a pass on Dan at the 4 minute mark, but Dan would not give up so easily. He put pressure on Richards for the last three minutes but JP was able to hold on for the win. JP ran JConcepts Blue Bar Codes front and rear. Congratulations to JP on these two wins! JP’s next race will be November 21st at the Ohio State Championships.